Below is a PolyMem Wound Dressing Selection Guide to help select the right dressing for your needs. Links to other PolyMem Dressings referenced above: PolyMem WIC, and PolyMem MAX. PolyMem is a multi-functional Wound Care dressing. PolyMem dressings are manufactured by Ferris and provides four key wound healing capabilities—cleanse, fill, absorb and moisten. PolyMem contains a mild non-ionic, non-toxic, tissue-friendly cleansing agent. 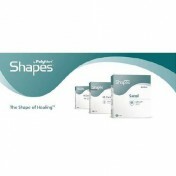 This PolyMem agent is activated by moisture that is gradually released into the wound bed. Built-in cleansing capabilities of PolyMem Dressings reduce the need to cleanse wounds during dressing changes, so you can avoid disrupting the growth of healthy tissue as the wound heals. 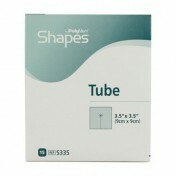 PolyMem Wound Dressings gently expand to fill and conform to the wound. PolyMem Dressings wick away up to 10 times its weight of wound exudate. 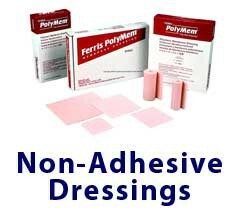 PolyMem Foam Dressings keep the wound moist and soothes traumatized tissues. This action reduces patient wound pain. 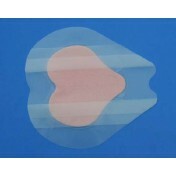 The moisturer keeps the dressing pad from adhering to the wound so it removes with virtually no pain. These four key wound healing capabilities activate only when needed to accommodate the needs of the individual wound type. If the PolyMem Dressing detects exudate, the absorption function is activated. If a wound cavity is present, the PolyMem Dressing will detect the cavity and fill it. 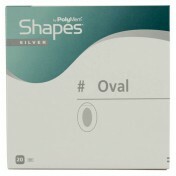 PolyMem dressing pads remove with virtually no pain making dressing changes easier and less traumatic for the patient. PolyMem Dressings can replace most common dressings such as polyurethane or silicone foam dressings, hydrogels, hydrocolloids, transparent films, gauze, and traditional dressings. 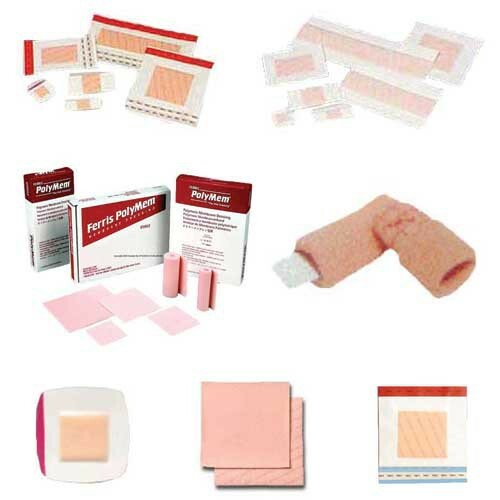 PolyMem provides a family of dressings, including Film Adhesive Dressings, Cloth Adhesive Dressings, Non-Adhesive Dressings, and Finger-toe Dressings to meet the needs of individual patients and their wound type. Clinical studies show that PolyMem dressings offer quicker wound recovery times than traditional dressings and have been found to help heal wounds that had previously been unsuccessfully treated. PolyMem uses glycerol to soothe traumatized tissues, reducing wound pain and providing comfort at the wound site. 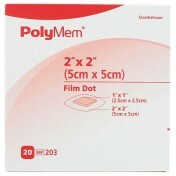 PolyMem Film Dressings provide excellent wound care for acute wounds, leg ulcers, vascular ulcers, and diabetic ulcers. 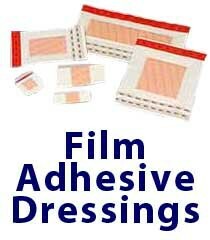 No tape or secondary dressing is required when using the PolyMed Film Dressing. 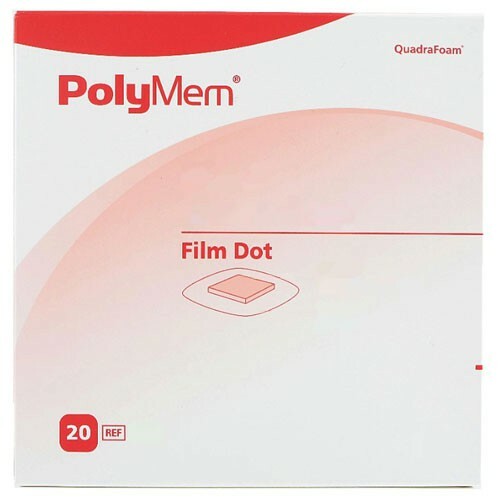 PolyMem Cloth Adhesive Dressings deliver the advantages of PolyMem technology and the benefits of a breathable, adhesive-coated cloth backing that is exceptionally comfortable for wound patients. PolyMem cloth-backed adhesive dressings are ideal for treating ecchymosis and resolving skin tears caused by friction and shear. PolyMem Non-adhesive Dressings are the optimal choice for applications where cutting to size and taping is your preferred method of application. 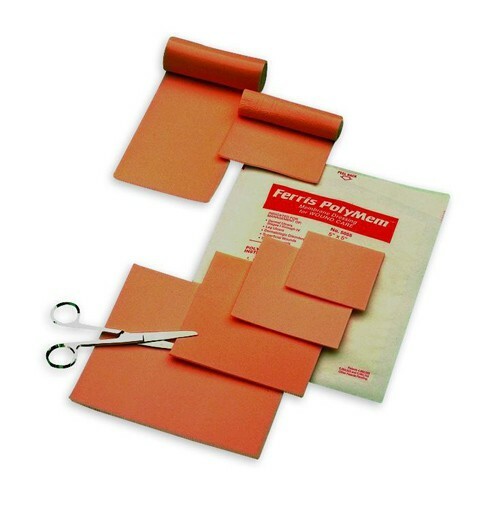 PolyMem conformable non-adhesive pad and roll dressings are available in numerous sizes. 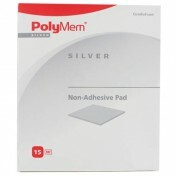 PolyMem Non Adhesive Dressings deliver innovative wound support to the widest possible case profiles. 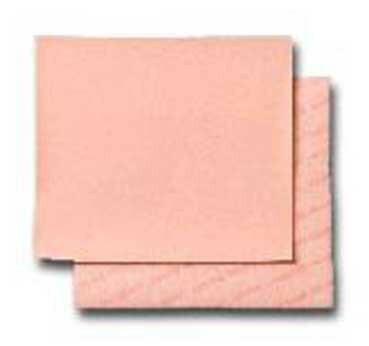 PolyMem Finger-Toe Dressings help reduce edema, bruising, pain and inflammation. The PolyMem Finger-Toe Dressing helps to manage sprains, strains, contusions, abrasion, lacerations, burns, ulcers and matricectomies. Provides four key wound-healing capabilities: Cleanses, Fills, Absorbs, Moistens. 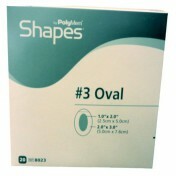 Reduces need for multiple wound care products. Streamlines the process of treating wounds. 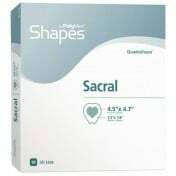 Treats the majority of wounds, including full- and partial-thickness wounds, skin tears, ulcers, surgical wounds, first- and second-degree burns. Creates an optimal healing environment. 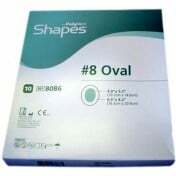 Provides up to seven days between changes, depending upon wound status. Ferris PolyMem also provides other specialized dressings for patient wound care to include PolyMem Silver, PolyMem Shapes, PolyMem WIC, and PolyMem MAX. 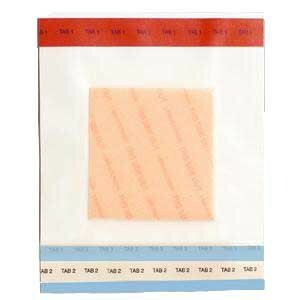 I would to ask whether the polymed non adhensive dressing must be directly contact with the wound, could it be the secondary dressing after applying alginate or keltostat, thanks. 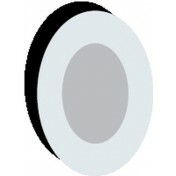 The dressing can be used both as a primary or secondary dressing. These work great. Stay put and are waterproof. I was introduced to PolyMem by my foot doctors. 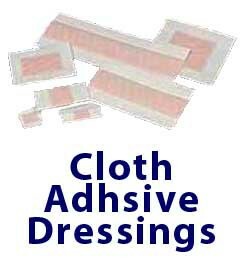 The dressings can be used with or without antibacterial ointment. They help speed healing of all types of wounds, especially more severe ones. As a diabetic I rely on them heavily and they work!